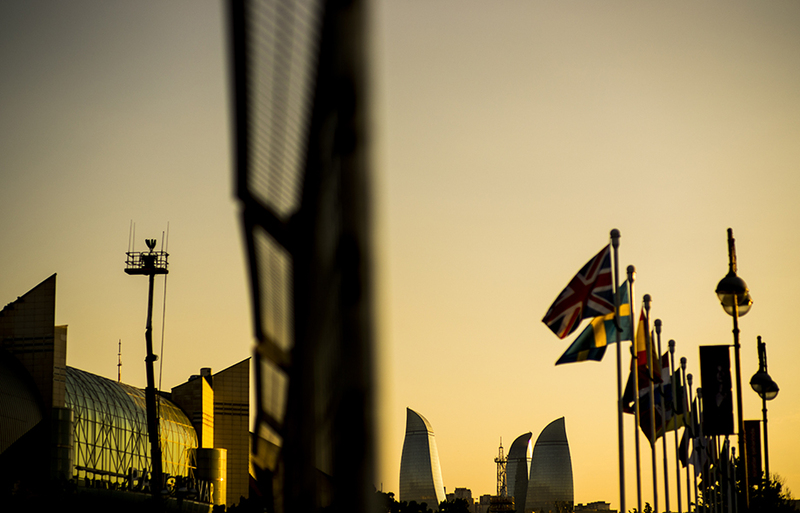 Sun sets down over the circuit during previews for the Azerbaijan Formula One Grand Prix at Baku City Circuit on June 22, 2017 in Baku, Azerbaijan. 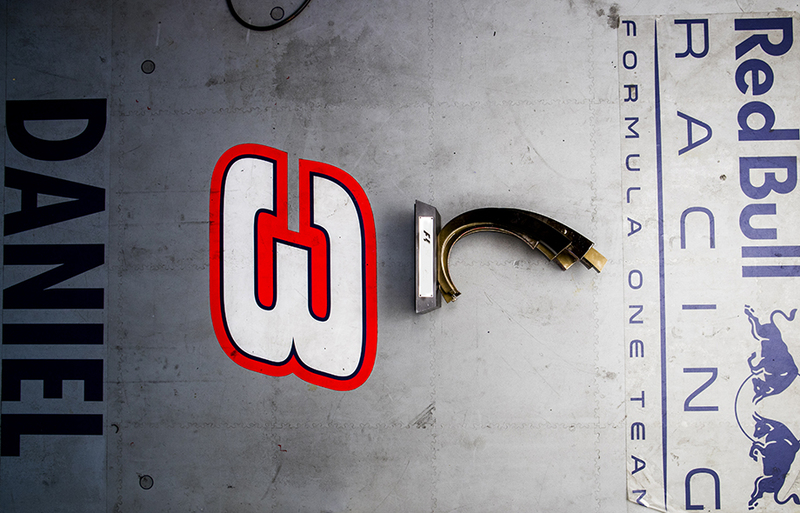 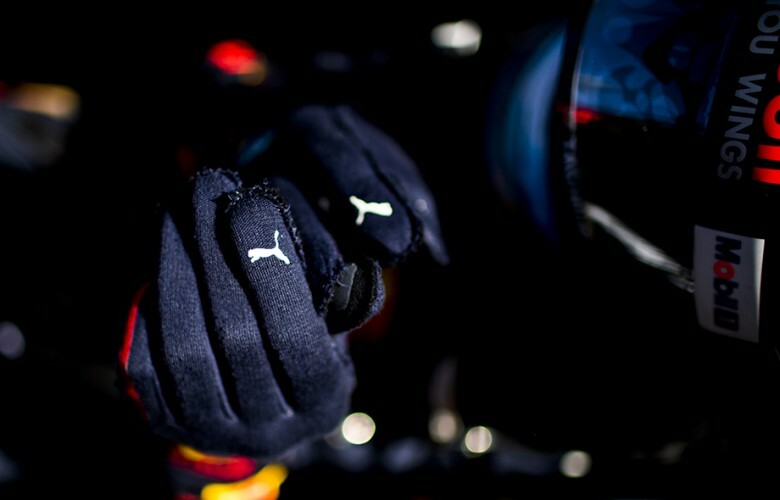 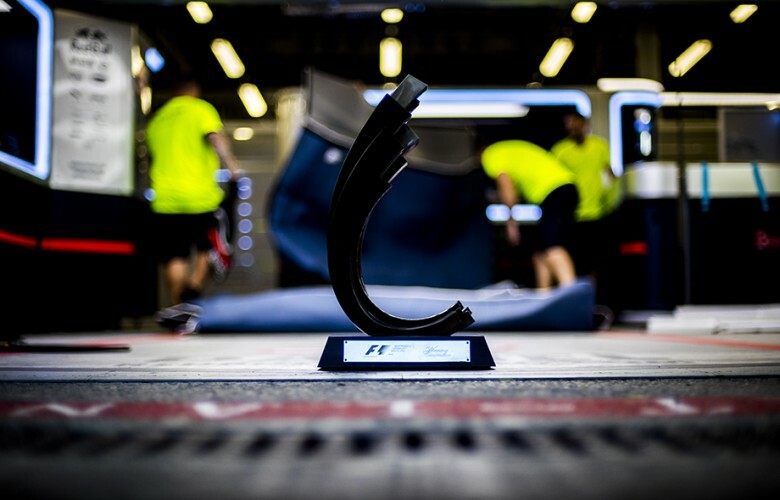 Detail view of the Red Bull Racing garage gear is seen during previews for the Azerbaijan Formula One Grand Prix at Baku City Circuit on June 22, 2017 in Baku, Azerbaijan. 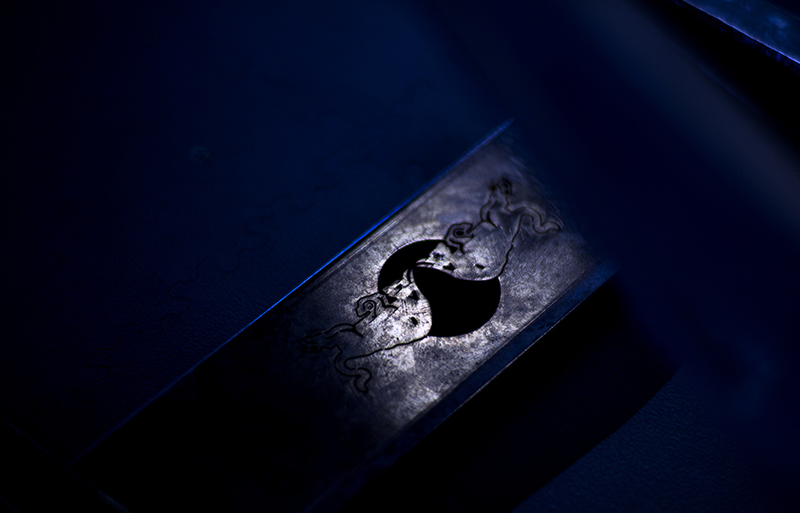 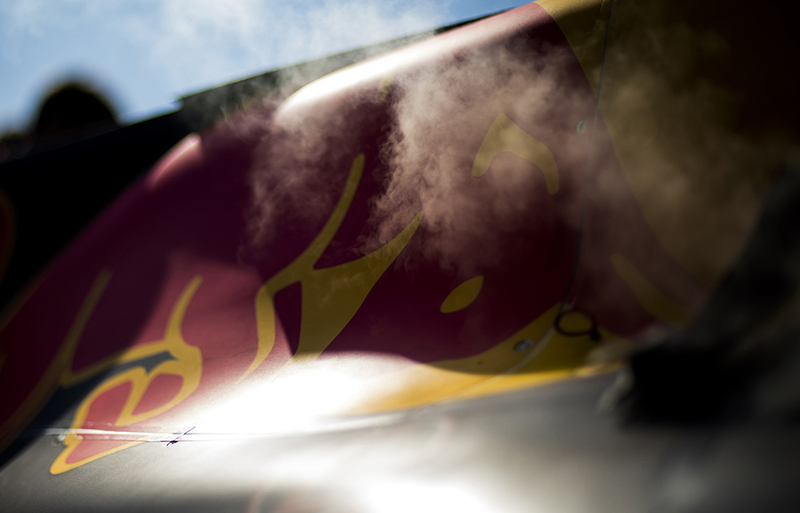 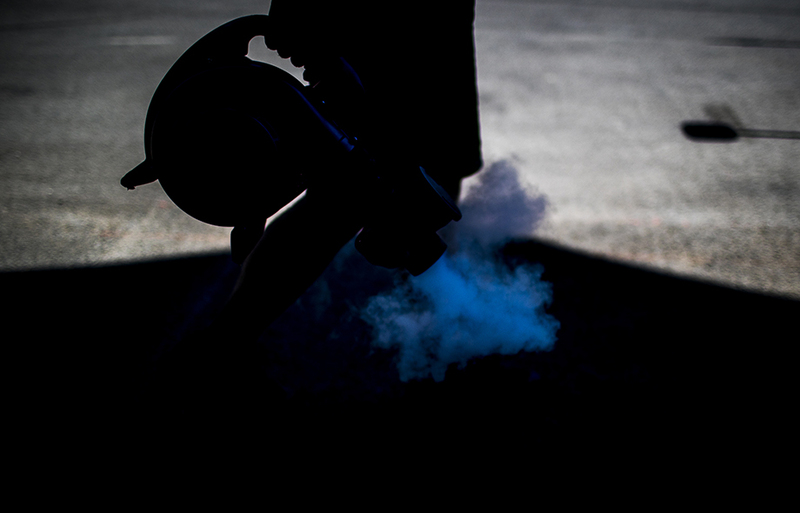 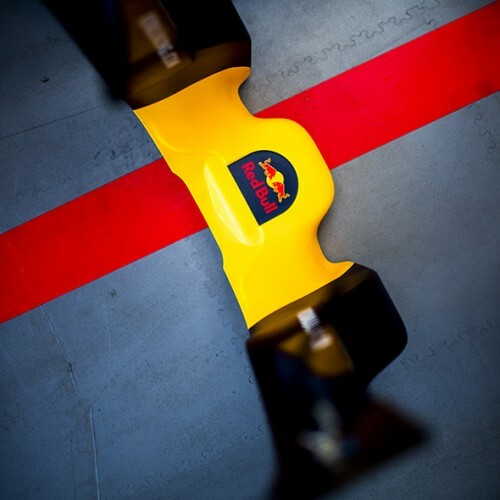 A Red Bull logo is seen on the garage gear during previews for the Azerbaijan Formula One Grand Prix at Baku City Circuit on June 22, 2017 in Baku, Azerbaijan. 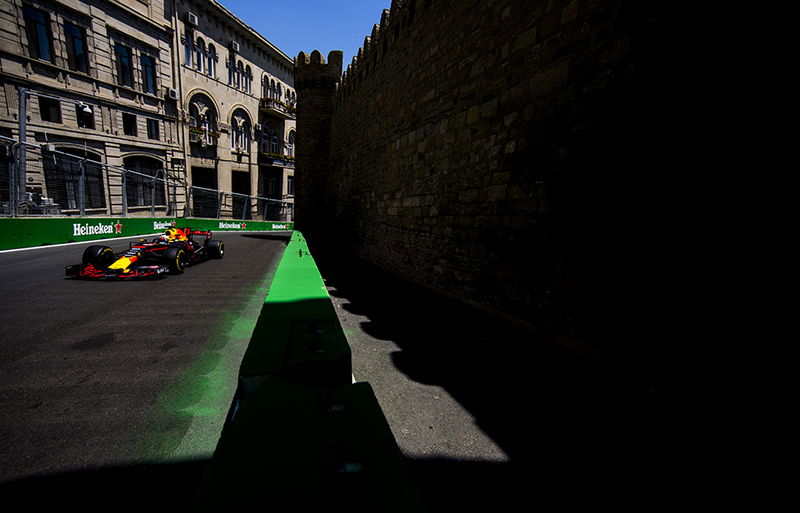 Daniel Ricciardo of Australia and Red Bull Racing drives his RB13 during practice for the Azerbaijan Formula One Grand Prix at Baku City Circuit on June 23, 2017 in Baku, Azerbaijan. 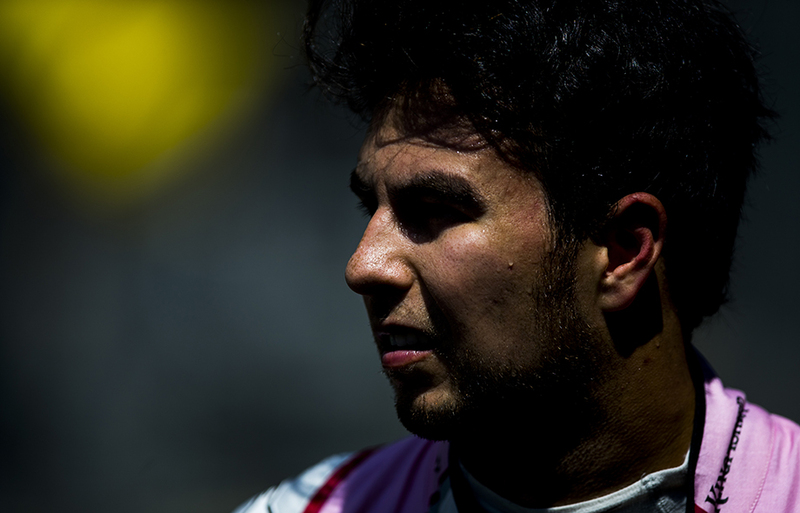 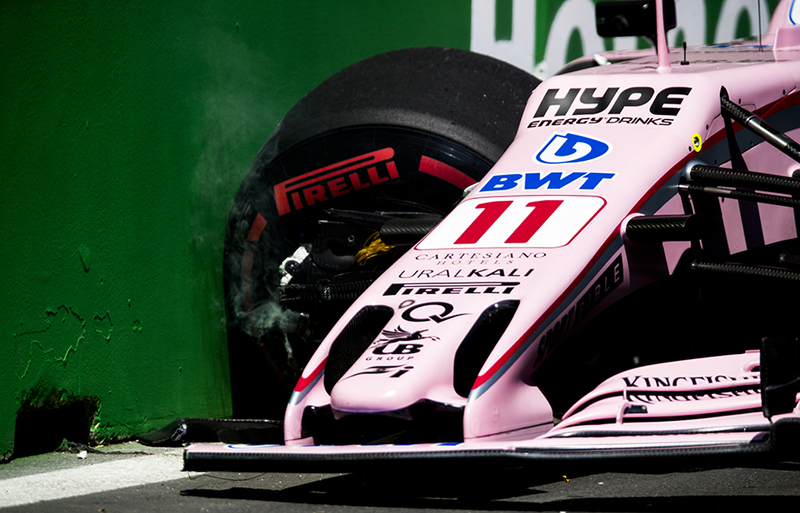 Sergio Perez of Mexico and Sahara Force India crashes during practice for the Azerbaijan Formula One Grand Prix at Baku City Circuit on June 23, 2017 in Baku, Azerbaijan. 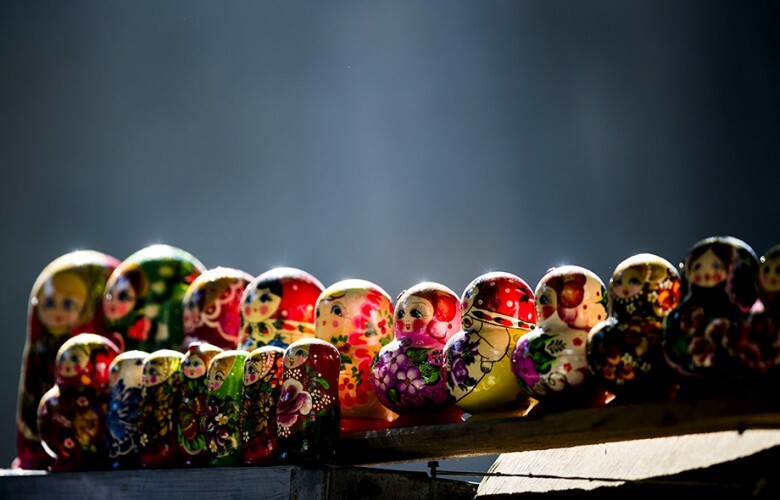 Traditional Matryoshka dolls are pictured at a street shop during practice for the Azerbaijan Formula One Grand Prix at Baku City Circuit on June 23, 2017 in Baku, Azerbaijan. 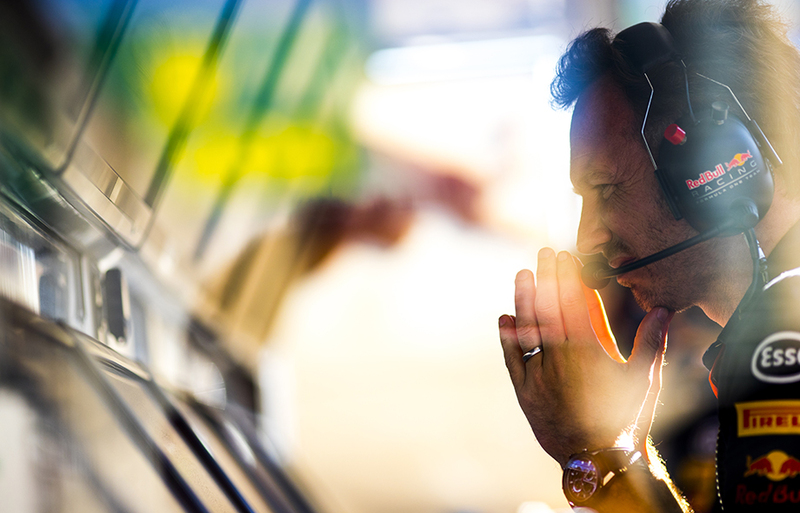 James Allison, Technical Director at Mercedes GP is pictured during previews for the Azerbaijan Formula One Grand Prix at Baku City Circuit on June 22, 2017 in Baku, Azerbaijan. 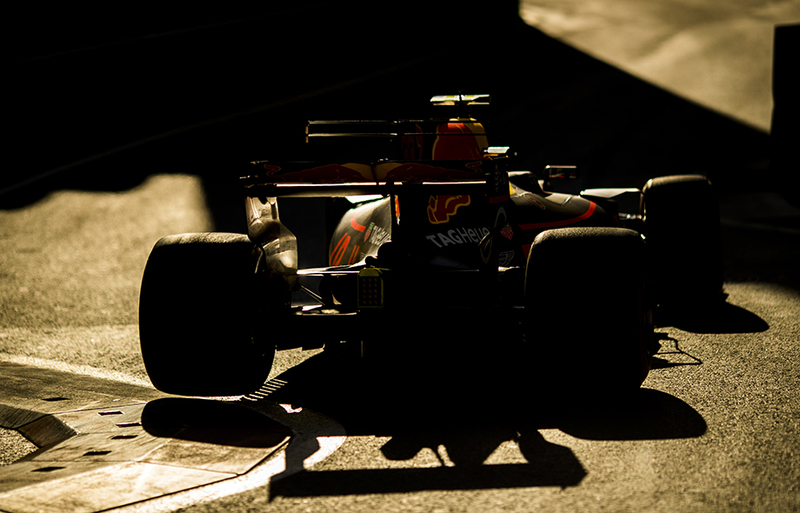 Max Verstappen of Netherlands and Red Bull Racing drives his RB13 during practice for the Azerbaijan Formula One Grand Prix at Baku City Circuit on June 23, 2017 in Baku, Azerbaijan. 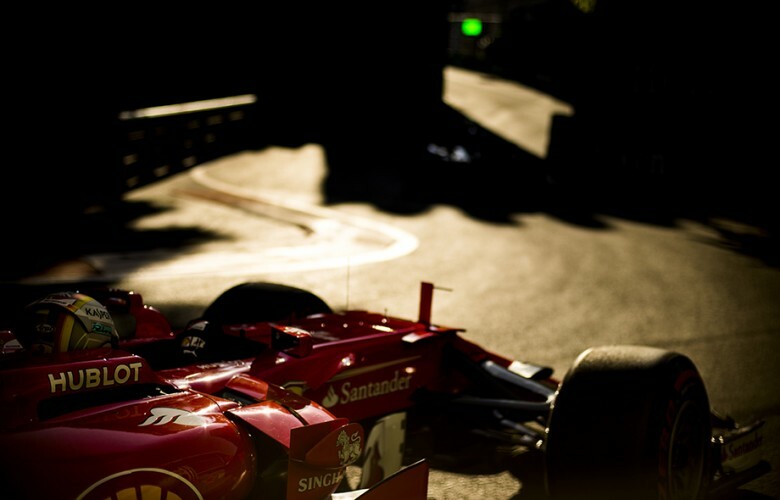 Kimi Raikkonen of Finland and Scuderia Ferrari drives his SF70H during practice for the Azerbaijan Formula One Grand Prix at Baku City Circuit on June 23, 2017 in Baku, Azerbaijan. 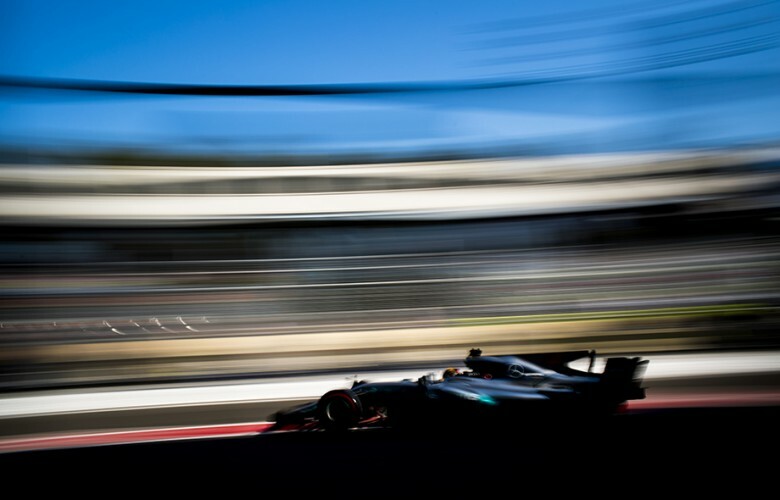 Lewis Hamilton of Great Britain and Mercedes AMG Petronas drives in W08 during practice for the Azerbaijan Formula One Grand Prix at Baku City Circuit on June 23, 2017 in Baku, Azerbaijan. Sebastian Vettel of Germany and Scuderia Ferrari drives his SF70H during practice for the Azerbaijan Formula One Grand Prix at Baku City Circuit on June 23, 2017 in Baku, Azerbaijan. Lewis Hamilton of Great Britain and Mercedes AMG Petronas leads Stoffel Vandoorne of Belgium and McLaren-Honda during practice for the Azerbaijan Formula One Grand Prix at Baku City Circuit on June 23, 2017 in Baku, Azerbaijan. 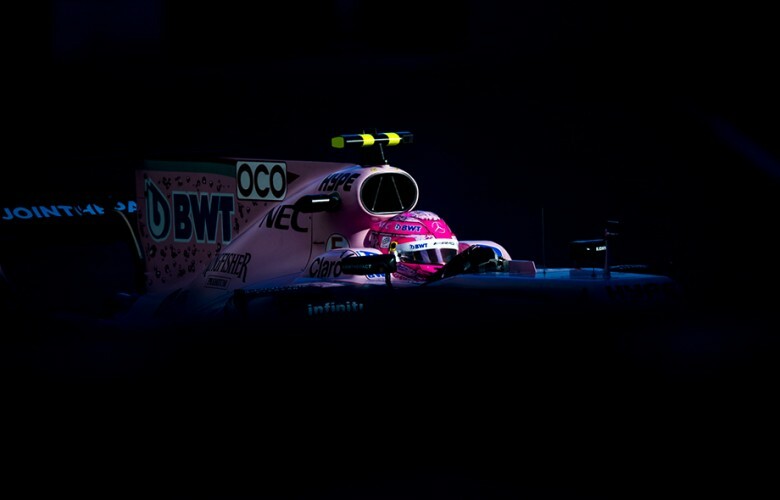 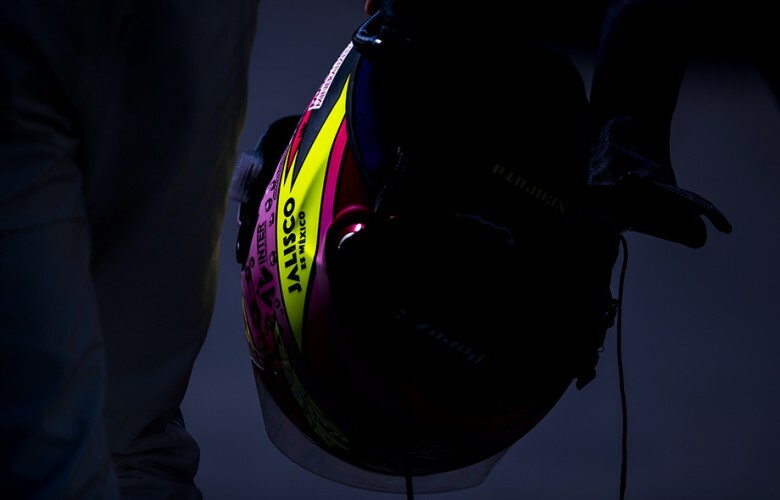 Esteban Ocon of France and Sahara Force India drives his VJM10 during practice for the Azerbaijan Formula One Grand Prix at Baku City Circuit on June 23, 2017 in Baku, Azerbaijan. 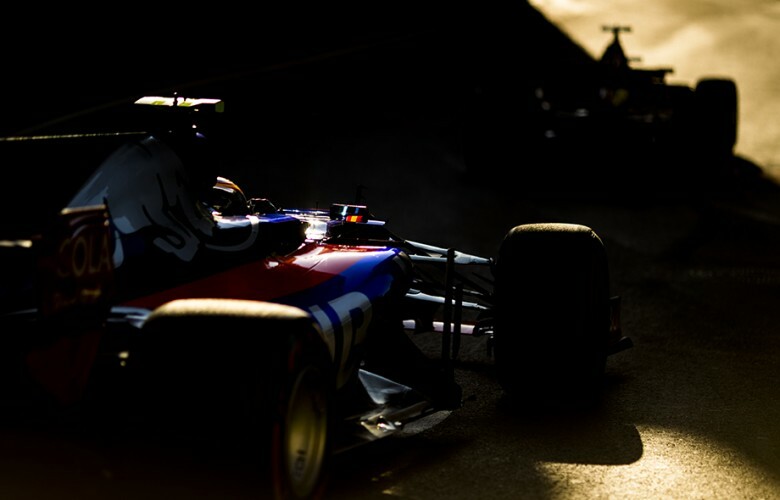 Carlos Sainz of Spain and Scuderia Toro Rosso drives his STR12 during practice for the Azerbaijan Formula One Grand Prix at Baku City Circuit on June 23, 2017 in Baku, Azerbaijan. 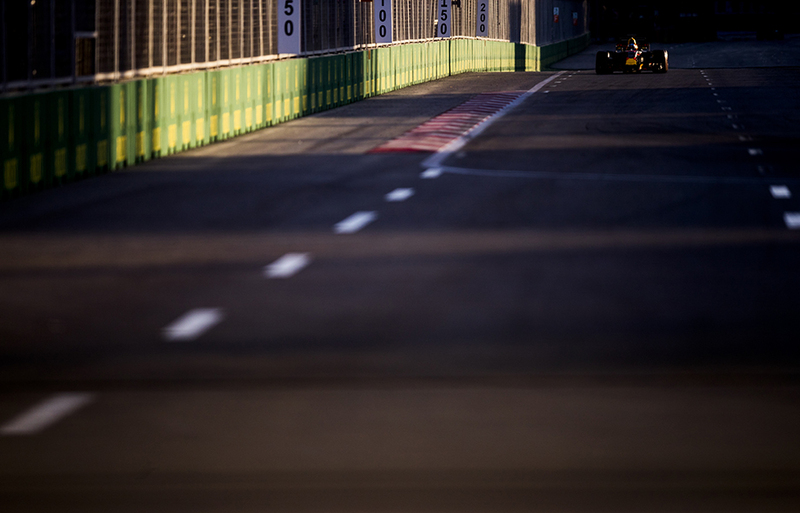 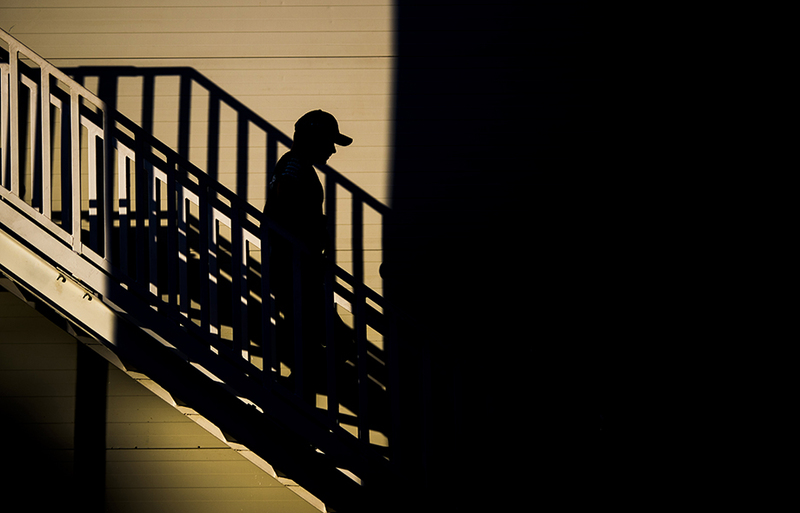 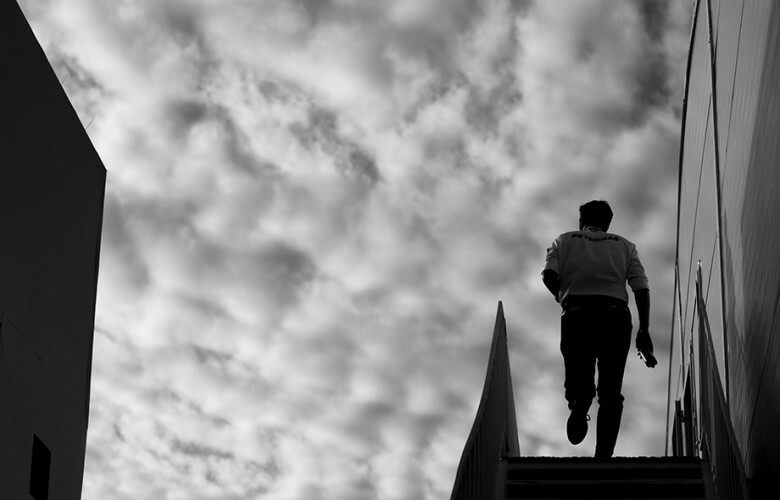 Max Verstappen of Netherlands and Red Bull Racing walks back to his garage during practice prior qualifying for the Azerbaijan Formula One Grand Prix at Baku City Circuit on June 24, 2017 in Baku, Azerbaijan. 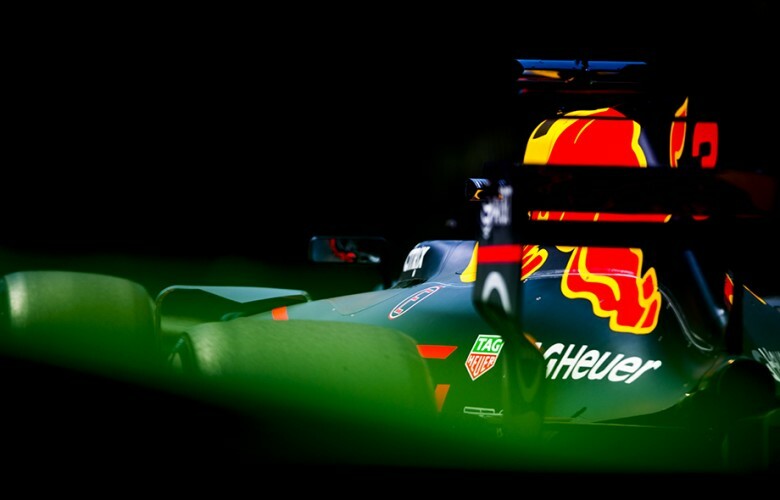 Daniel Ricciardo of Australia and Red Bull Racing drives his RB13 during practice prior qualifying for the Azerbaijan Formula One Grand Prix at Baku City Circuit on June 24, 2017 in Baku, Azerbaijan. A detail view of the headrest of Red Bull Racing's RB13 is seen during practice prior qualifying for the Azerbaijan Formula One Grand Prix at Baku City Circuit on June 24, 2017 in Baku, Azerbaijan. 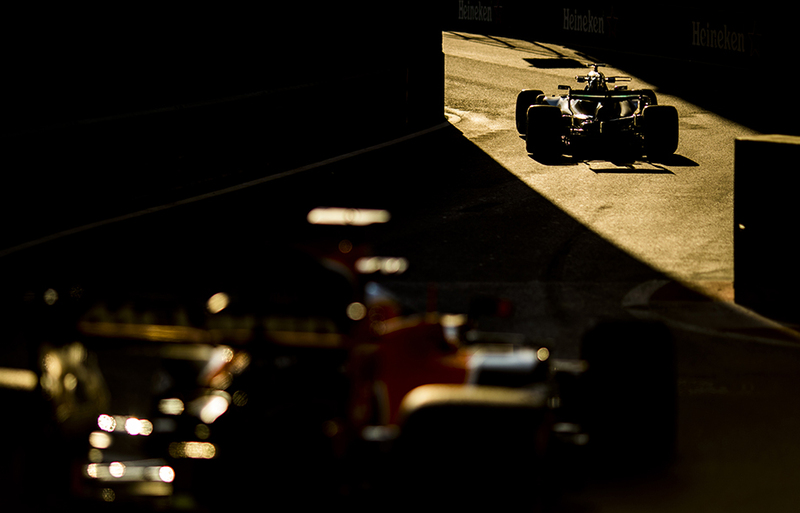 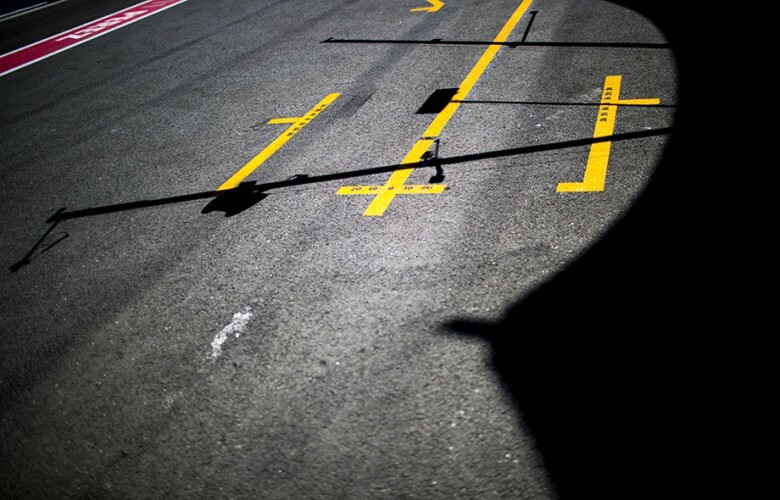 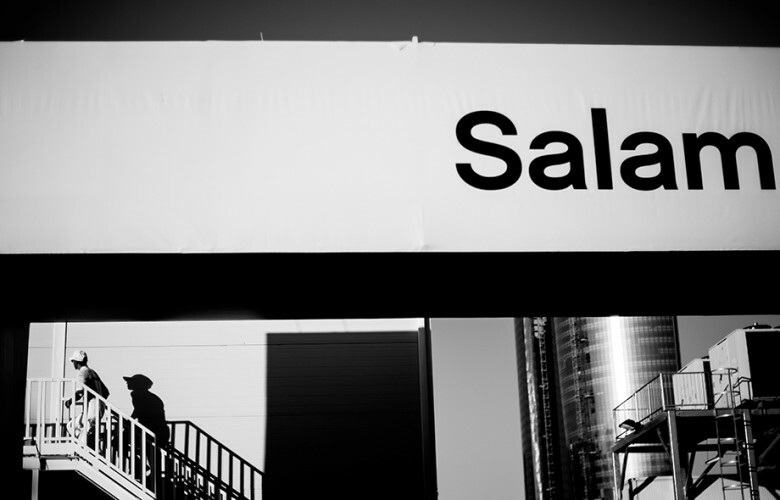 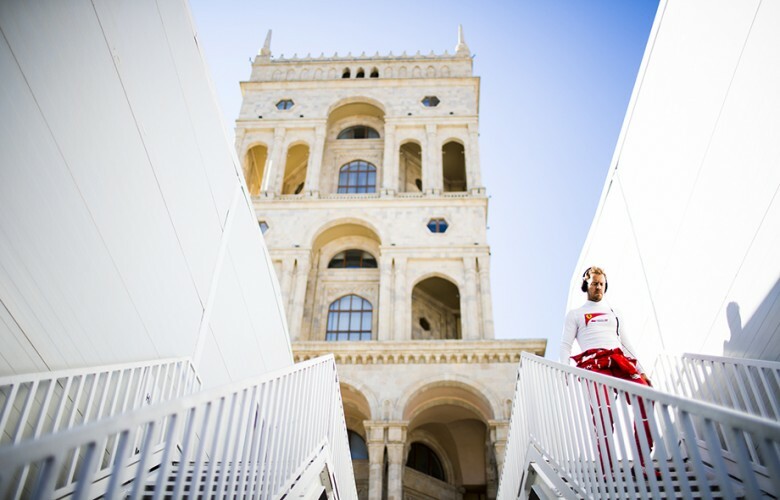 A detail view of the pitlane is seen during practice prior qualifying for the Azerbaijan Formula One Grand Prix at Baku City Circuit on June 24, 2017 in Baku, Azerbaijan. 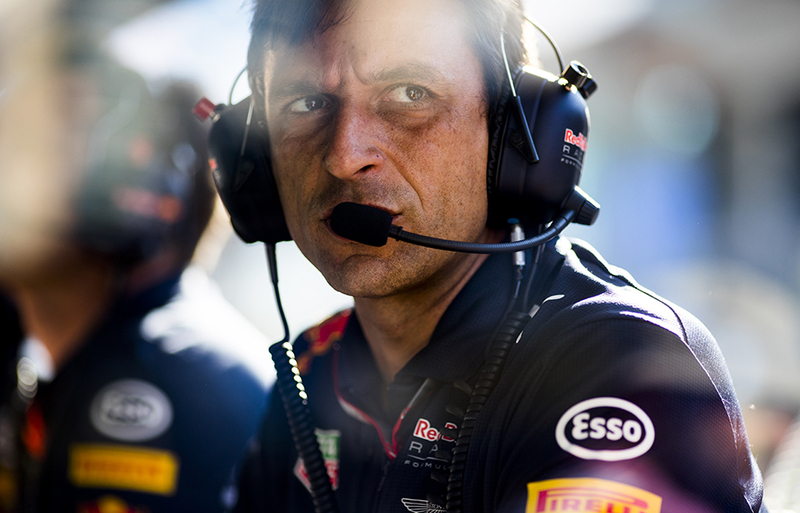 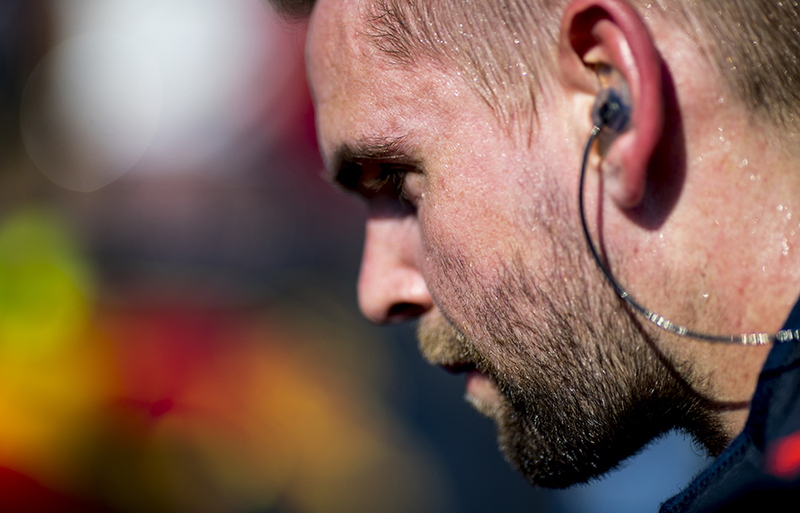 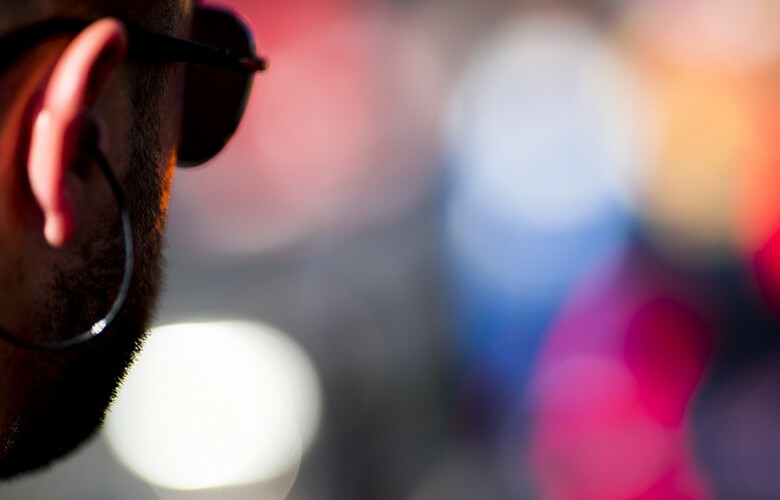 Pierre Wache, Chief Engineer of Performance Engineering at Red Bull Racing is pictured during qualifying for the Azerbaijan Formula One Grand Prix at Baku City Circuit on June 24, 2017 in Baku, Azerbaijan. 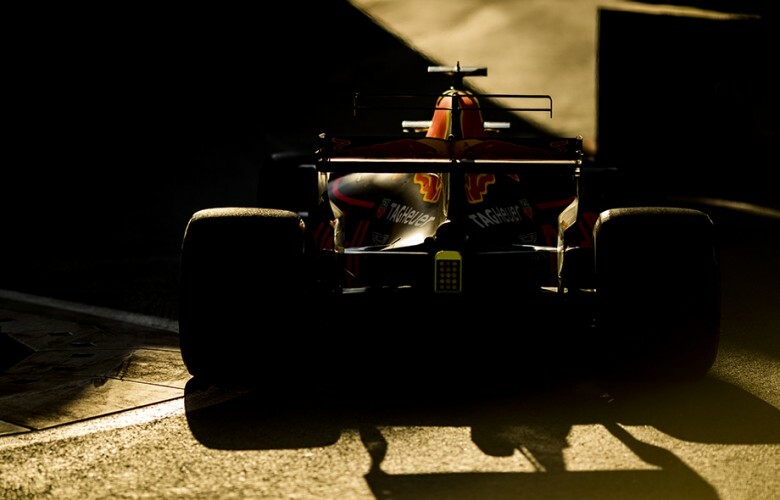 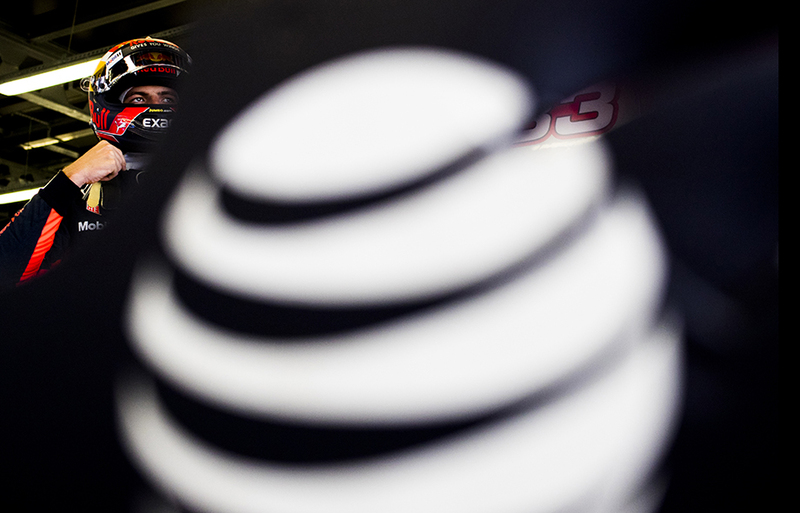 Max Verstappen of Netherlands and Red Bull Racing prepares inside the garage for the qualifying for the Azerbaijan Formula One Grand Prix at Baku City Circuit on June 24, 2017 in Baku, Azerbaijan. 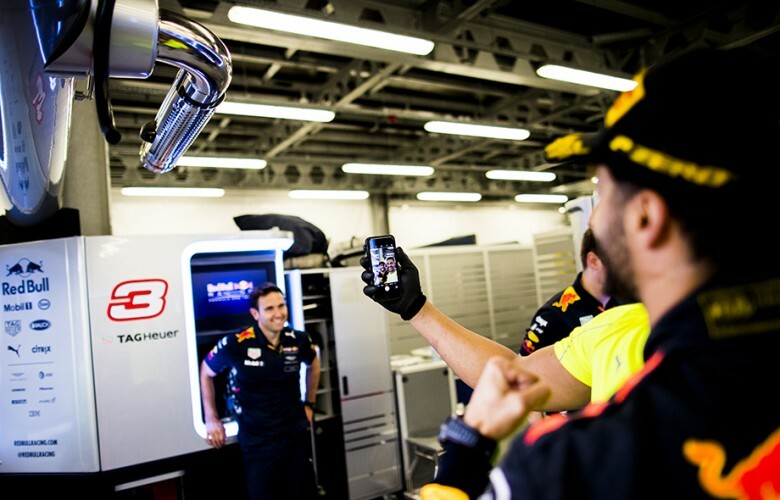 Red Bull Racing mechanics work inside the garage during practice prior qualifying for the Azerbaijan Formula One Grand Prix at Baku City Circuit on June 24, 2017 in Baku, Azerbaijan. 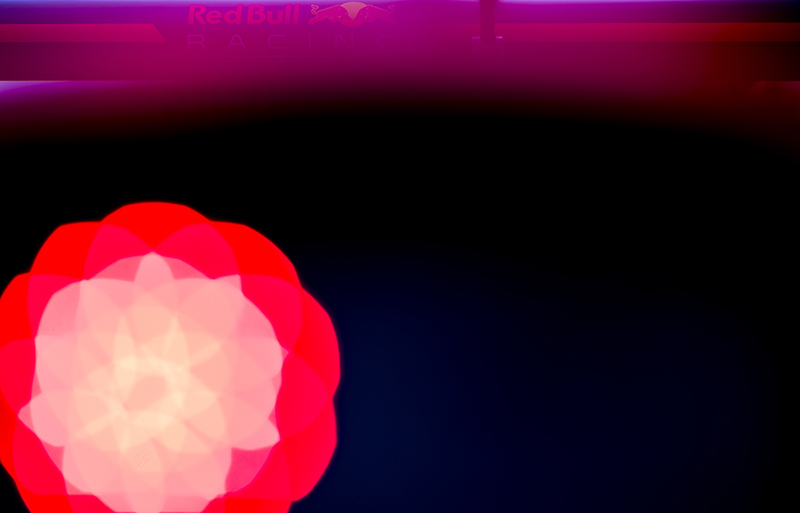 Daniel Ricciardo of Australia and Red Bull Racing inside his cockpit during practice prior qualifying for the Azerbaijan Formula One Grand Prix at Baku City Circuit on June 24, 2017 in Baku, Azerbaijan. 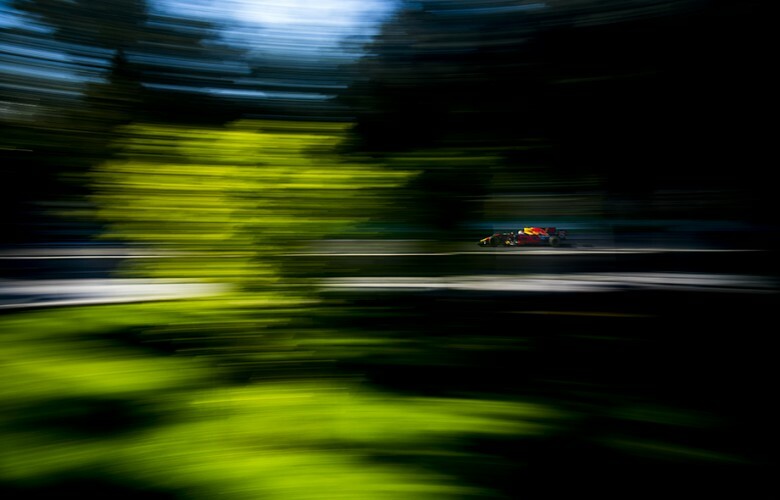 Red Bull Racing Team Principal Christian Horner is seen during qualifying for the Azerbaijan Formula One Grand Prix at Baku City Circuit on June 24, 2017 in Baku, Azerbaijan. 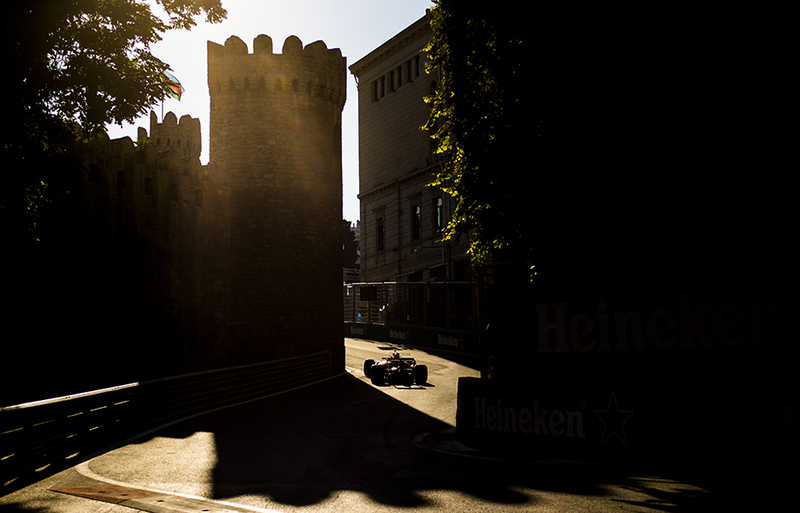 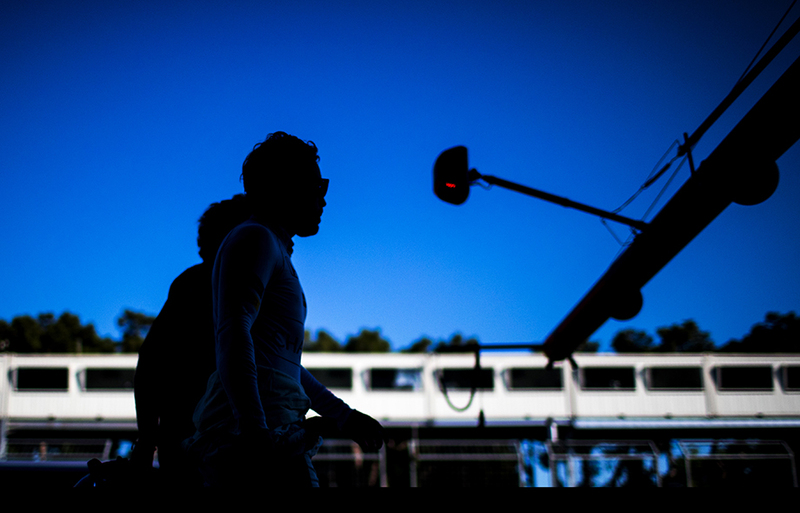 Fernando Alonso of Spain and McLaren-Honda walks down the pitlane after his elimination during qualifying for the Azerbaijan Formula One Grand Prix at Baku City Circuit on June 24, 2017 in Baku, Azerbaijan. Lewis Hamilton of Great Britain and Mercedes AMG Petronas and his team mate Valtteri Bottas of Finland and Mercedes AMG Petronas are seen following qualifying for the Azerbaijan Formula One Grand Prix at Baku City Circuit on June 24, 2017 in Baku, Azerbaijan. 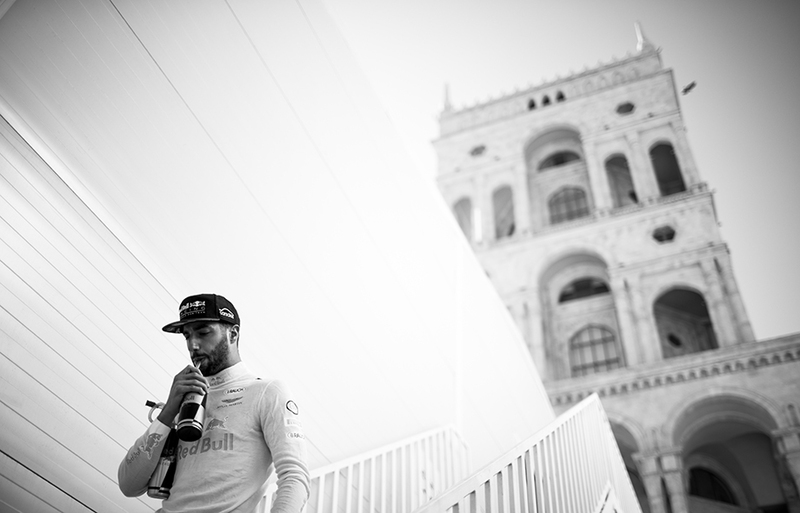 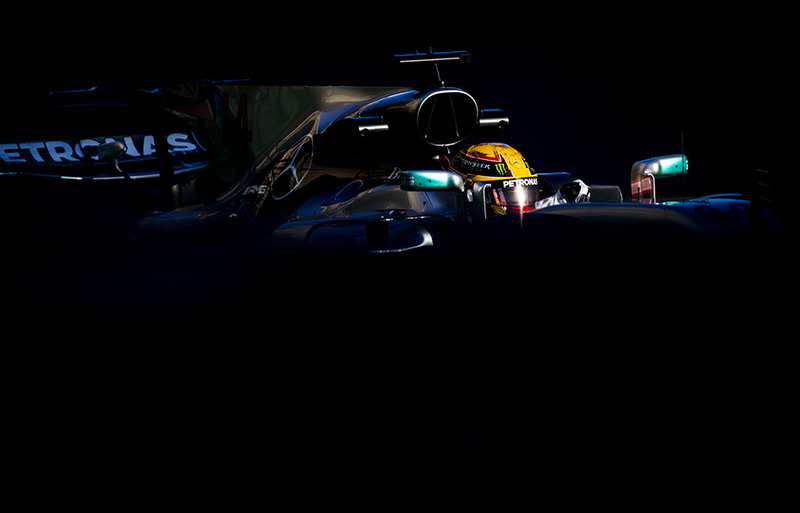 Lewis Hamilton of Great Britain and Mercedes AMG Petronas is pictured in the paddock following qualifying for the Azerbaijan Formula One Grand Prix at Baku City Circuit on June 24, 2017 in Baku, Azerbaijan. 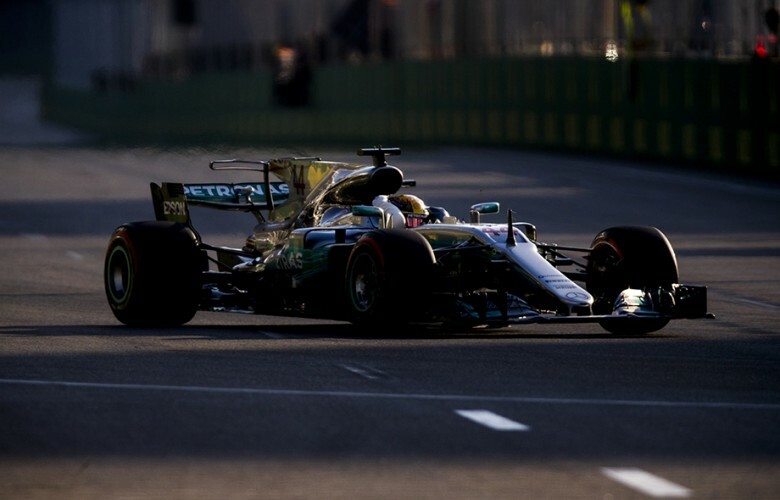 Lewis Hamilton of Great Britain and Mercedes AMG Petronas drives in W08 during qualifying for the Azerbaijan Formula One Grand Prix at Baku City Circuit on June 24, 2017 in Baku, Azerbaijan. Lewis Hamilton of Great Britain and Mercedes AMG Petronas is seen following his qualifying pole position for the Azerbaijan Formula One Grand Prix at Baku City Circuit on June 24, 2017 in Baku, Azerbaijan. 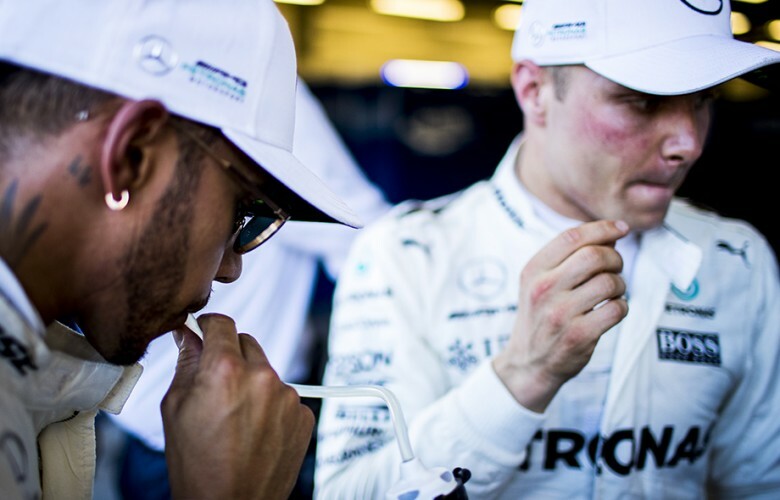 Valtteri Bottas of Finland and Mercedes AMG Petronas is pictured in the paddock following qualifying for the Azerbaijan Formula One Grand Prix at Baku City Circuit on June 24, 2017 in Baku, Azerbaijan. 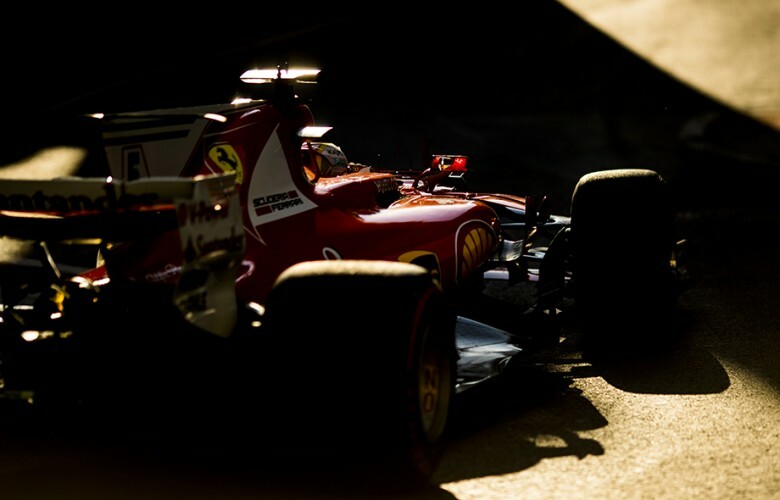 Sebastian Vettel of Germany and Scuderia Ferrari is seen in the paddock prior qualifying for the Azerbaijan Formula One Grand Prix at Baku City Circuit on June 24, 2017 in Baku, Azerbaijan. Daniel Ricciardo of Australia and Red Bull Racing is seen in the paddock prior qualifying for the Azerbaijan Formula One Grand Prix at Baku City Circuit on June 24, 2017 in Baku, Azerbaijan. Grid girls are seen ahead of the Azerbaijan Formula One Grand Prix at Baku City Circuit on June 25, 2017 in Baku, Azerbaijan. 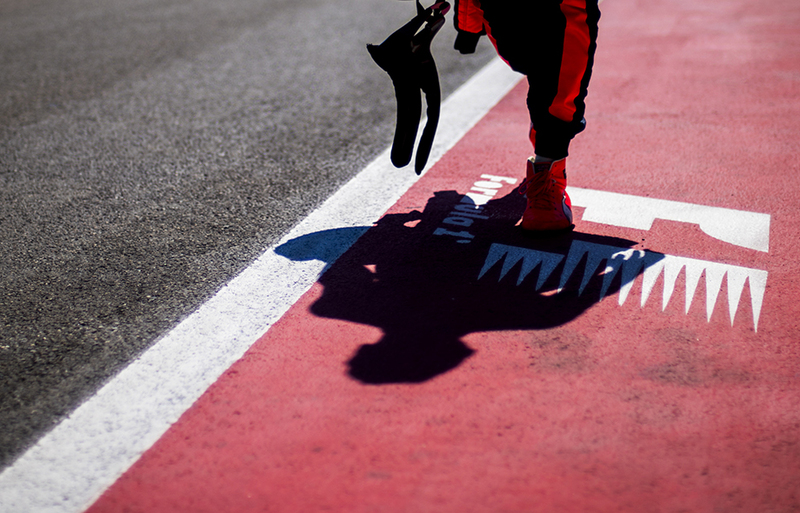 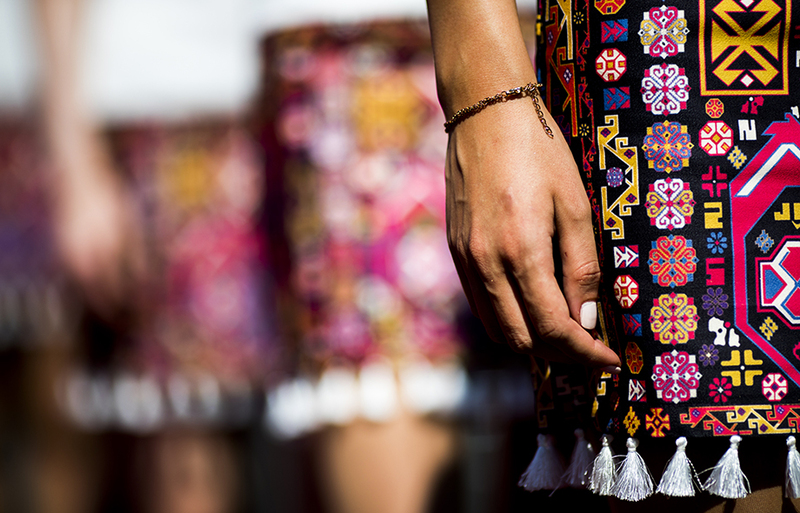 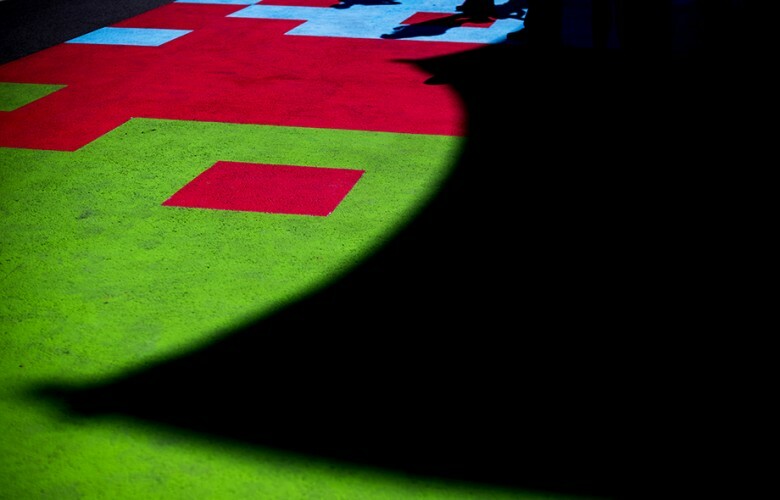 Azerbaijani colours are seen on the pitlane surface ahead of the Azerbaijan Formula One Grand Prix at Baku City Circuit on June 25, 2017 in Baku, Azerbaijan. 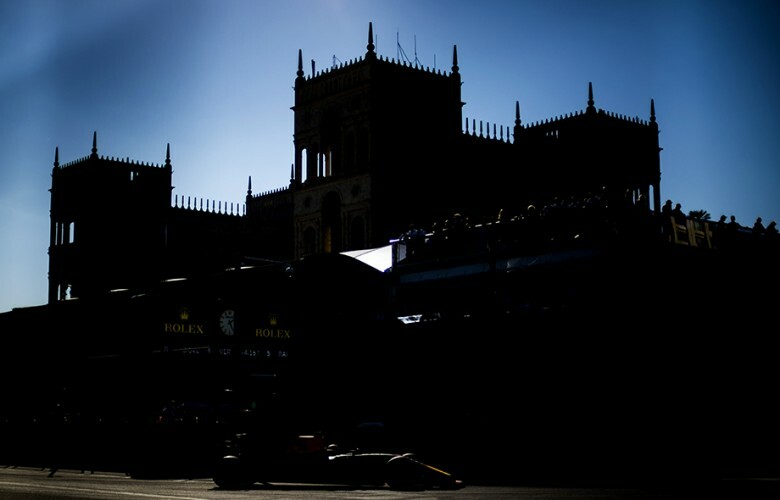 Red Bull Racing mechanics work on the grid prior to the Azerbaijan Formula One Grand Prix at Baku City Circuit on June 25, 2017 in Baku, Azerbaijan. 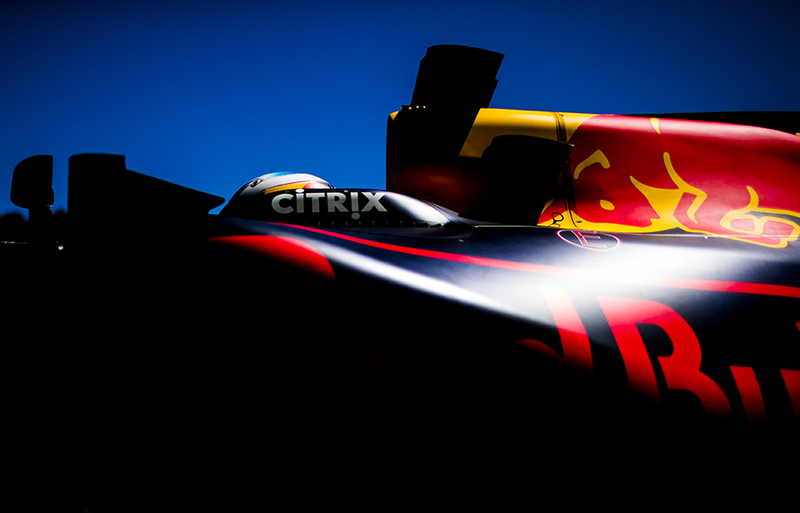 The RB13 of Max Verstappen of Netherlands and Red Bull Racing is being cooled down on the grid prior to the Azerbaijan Formula One Grand Prix at Baku City Circuit on June 25, 2017 in Baku, Azerbaijan. 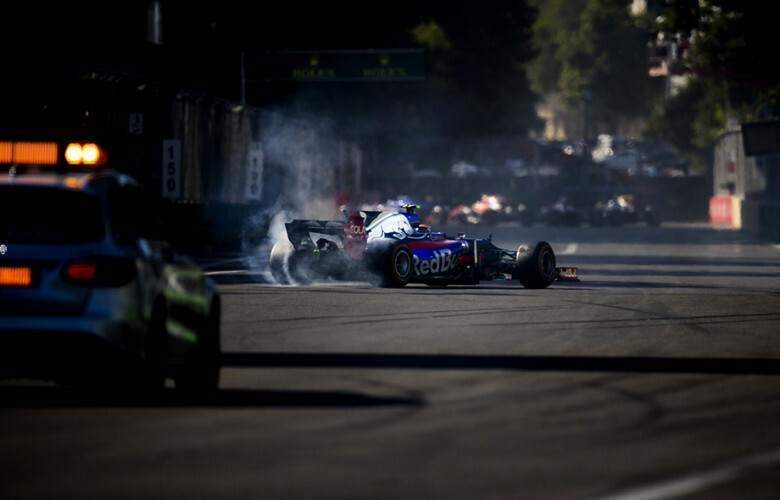 Carlos Sainz of Spain and Scuderia Toro Rosso spins inside the first corner during the Azerbaijan Formula One Grand Prix at Baku City Circuit on June 25, 2017 in Baku, Azerbaijan. Lewis Hamilton of Great Britain and Mercedes AMG Petronas leads Sebastian Vettel of Germany and Scuderia Ferrari at a restart during the Azerbaijan Formula One Grand Prix at Baku City Circuit on June 25, 2017 in Baku, Azerbaijan. 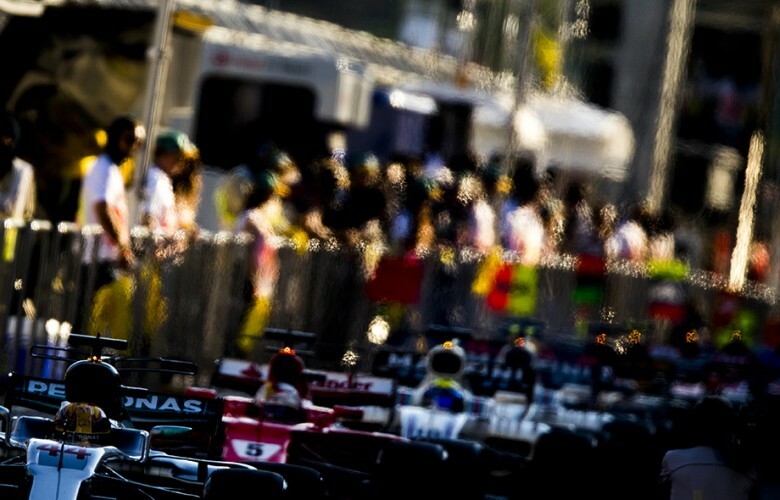 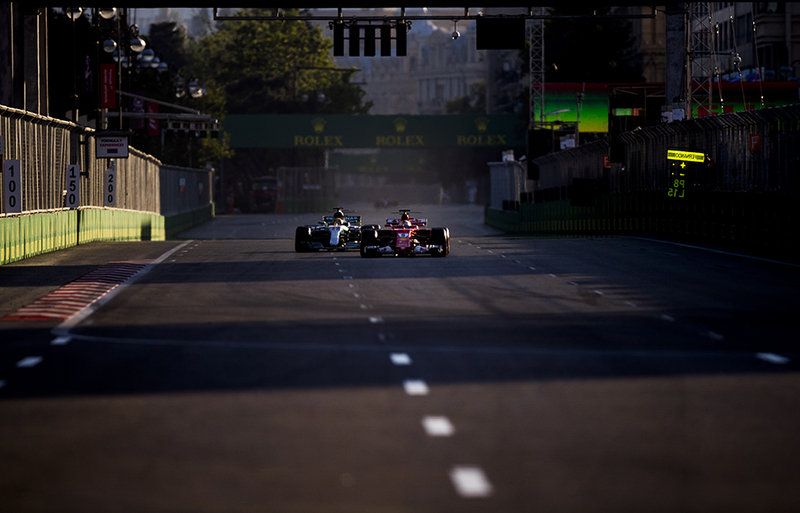 Daniel Ricciardo of Australia and Red Bull Racing makes a move on Lance Stroll of Canada and Williams Martini Racing and Felipe Massa of Brazil and Williams Martini Racing as Nico Hulkenberg of Germany and Renault Sport Formula 1 Team follows during the Azerbaijan Formula One Grand Prix at Baku City Circuit on June 25, 2017 in Baku, Azerbaijan. 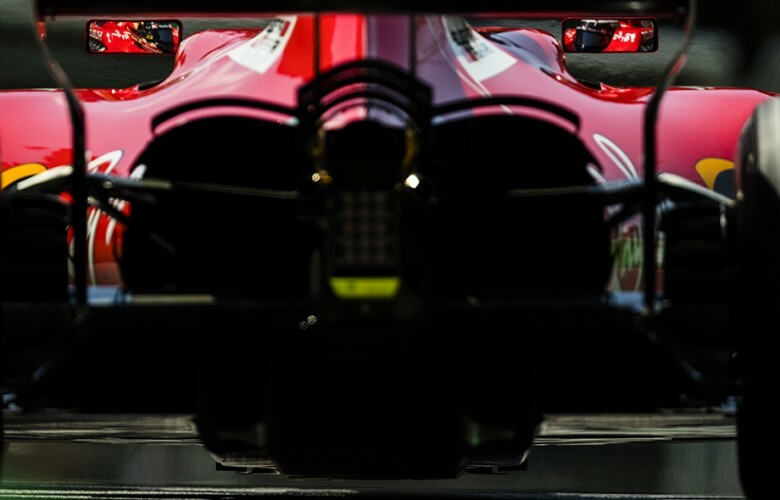 Sebastian Vettel of Germany and Scuderia Ferrari defends his position against Lewis Hamilton of Great Britain and Mercedes AMG Petronas during the Azerbaijan Formula One Grand Prix at Baku City Circuit on June 25, 2017 in Baku, Azerbaijan. Daniel Ricciardo of Australia and Red Bull Racing drives his RB13 during the Azerbaijan Formula One Grand Prix at Baku City Circuit on June 25, 2017 in Baku, Azerbaijan. 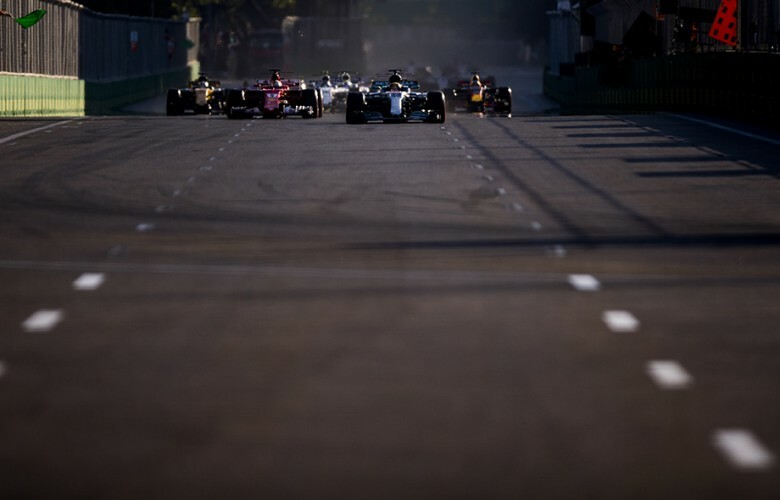 Lewis Hamilton of Great Britain and Mercedes AMG Petronas leads the pack of cars in the pitlane during a red flag break the Azerbaijan Formula One Grand Prix at Baku City Circuit on June 25, 2017 in Baku, Azerbaijan. 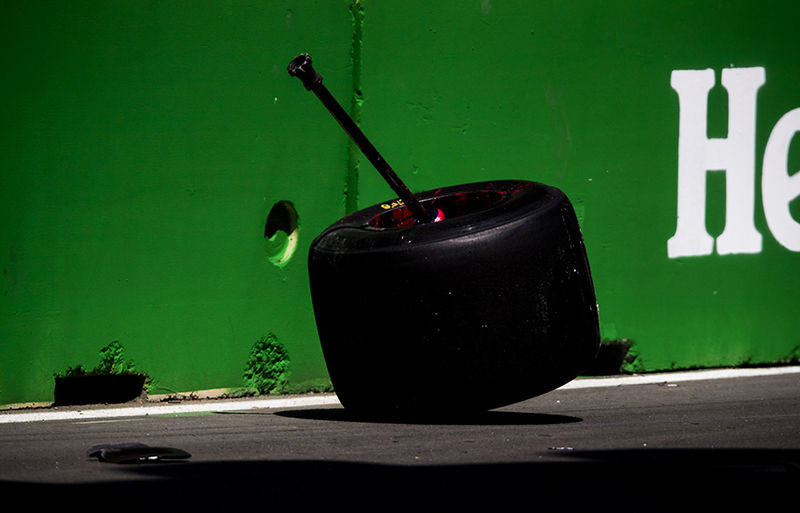 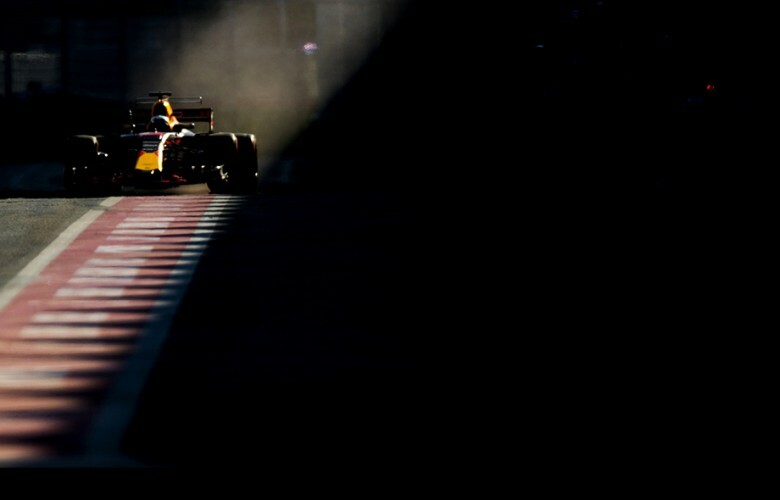 Daniel Ricciardo of Australia and Red Bull Racing drives in for a pitstop during the Azerbaijan Formula One Grand Prix at Baku City Circuit on June 25, 2017 in Baku, Azerbaijan. 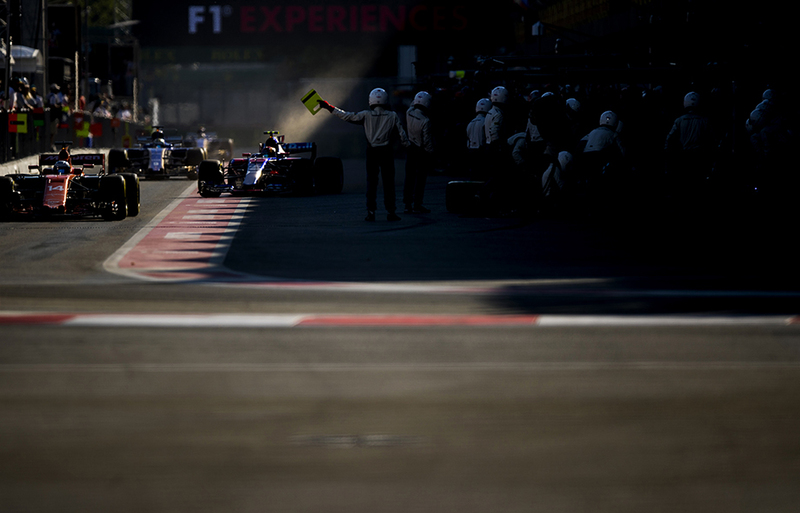 Fernando Alonso of Spain and McLaren-Honda, Carlos Sainz of Spain and Scuderia Toro Rosso and Marcus Ericsson of Sweden and Sauber F1 Team drive in for a pitstop during the Azerbaijan Formula One Grand Prix at Baku City Circuit on June 25, 2017 in Baku, Azerbaijan. 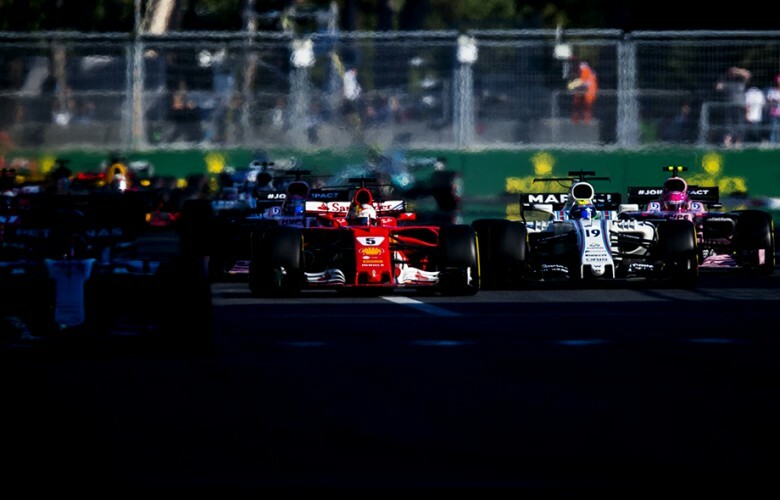 Sebastian Vettel of Germany and Scuderia Ferrari battles Felipe Massa of Brazil and Williams Martini Racing and Esteban Ocon of France and Sahara Force India during the Azerbaijan Formula One Grand Prix at Baku City Circuit on June 25, 2017 in Baku, Azerbaijan. 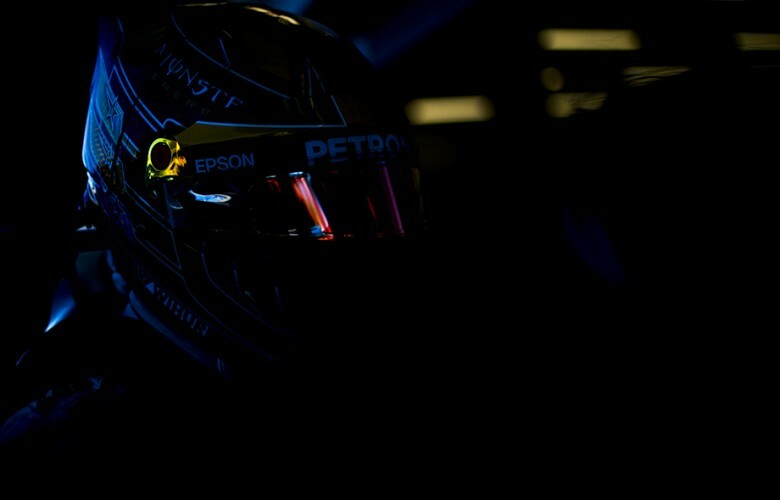 Lewis Hamilton of Great Britain and Mercedes AMG Petronas holds his lose headrest during the Azerbaijan Formula One Grand Prix at Baku City Circuit on June 25, 2017 in Baku, Azerbaijan. 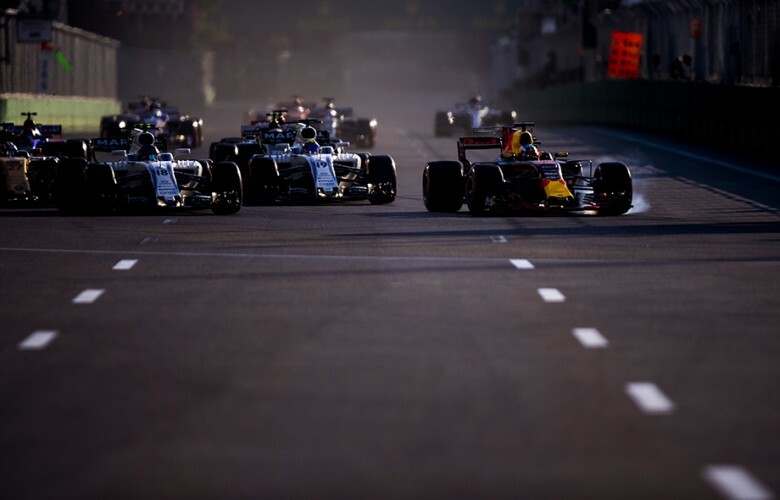 Daniel Ricciardo of Australia and Red Bull Racing drives down the finish straight during the Azerbaijan Formula One Grand Prix at Baku City Circuit on June 25, 2017 in Baku, Azerbaijan. Team Red Bull Racing celebrates the win of Daniel Ricciardo of Australia and Red Bull Racing during the Azerbaijan Formula One Grand Prix at Baku City Circuit on June 25, 2017 in Baku, Azerbaijan. 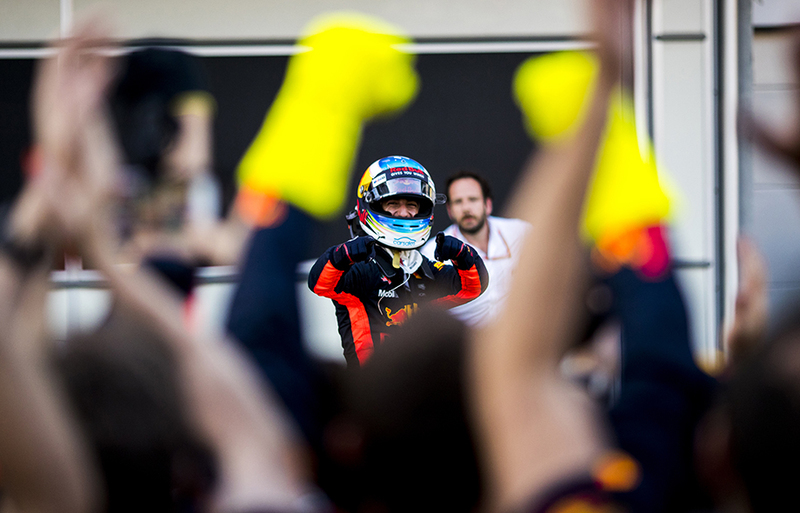 Daniel Ricciardo of Australia and Red Bull Racing celebrates after winning the Azerbaijan Formula One Grand Prix at Baku City Circuit on June 25, 2017 in Baku, Azerbaijan. Daniel Ricciardo of Australia and Red Bull Racing celebrates with his team following his win during the Azerbaijan Formula One Grand Prix at Baku City Circuit on June 25, 2017 in Baku, Azerbaijan. 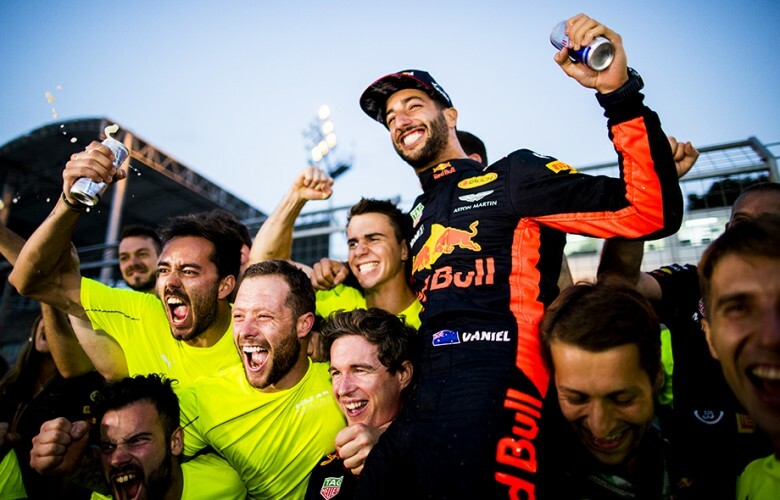 Daniel Ricciardo of Australia and Red Bull Racing is celebrated by his team after winning the Azerbaijan Formula One Grand Prix at Baku City Circuit on June 25, 2017 in Baku, Azerbaijan. 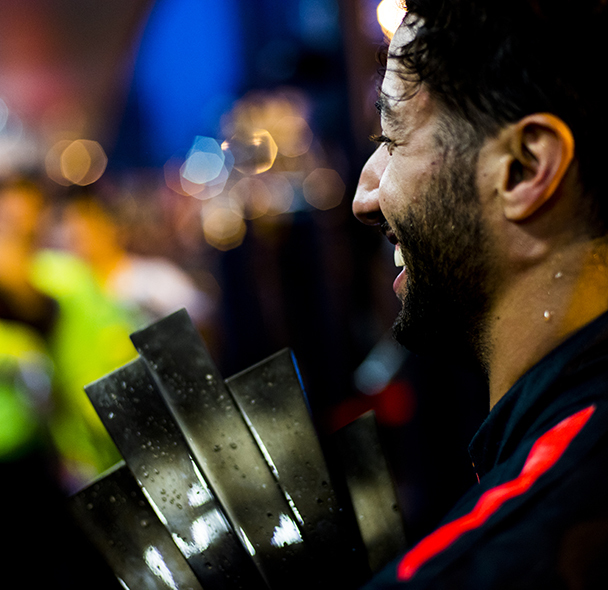 Daniel Ricciardo of Australia and Red Bull Racing holds his trophy following his win during the Azerbaijan Formula One Grand Prix at Baku City Circuit on June 25, 2017 in Baku, Azerbaijan. 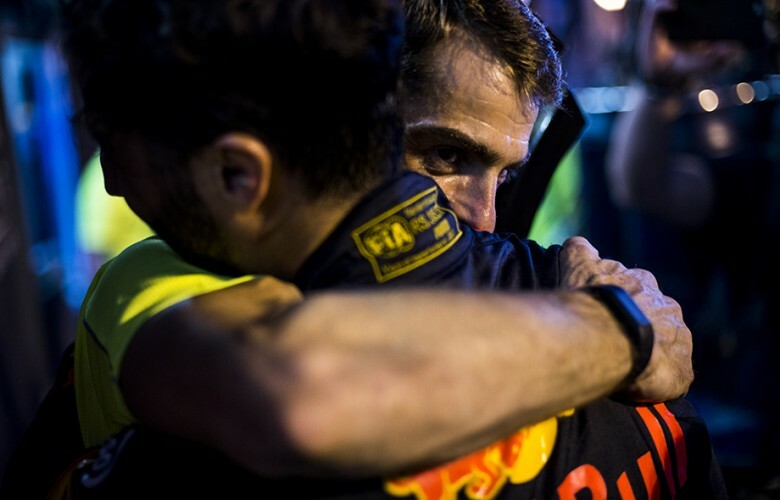 Daniel Ricciardo of Australia and Red Bull Racing is hugged by his chief mechanic Chris Gent following his win during the Azerbaijan Formula One Grand Prix at Baku City Circuit on June 25, 2017 in Baku, Azerbaijan. Winning Constructor trophy is seen as Red Bull mechanics break down the garage following the Azerbaijan Formula One Grand Prix at Baku City Circuit on June 25, 2017 in Baku, Azerbaijan. 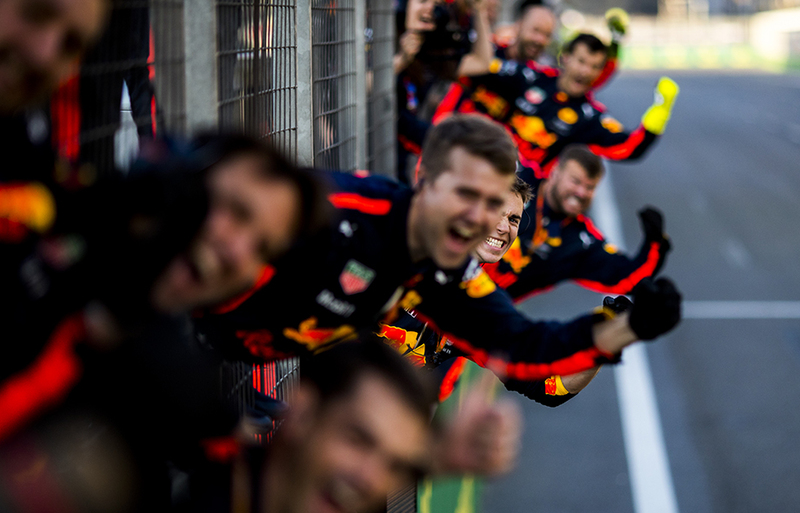 Daniel Ricciardo of Australia and Red Bull Racing reacts following his win during the Azerbaijan Formula One Grand Prix at Baku City Circuit on June 25, 2017 in Baku, Azerbaijan. 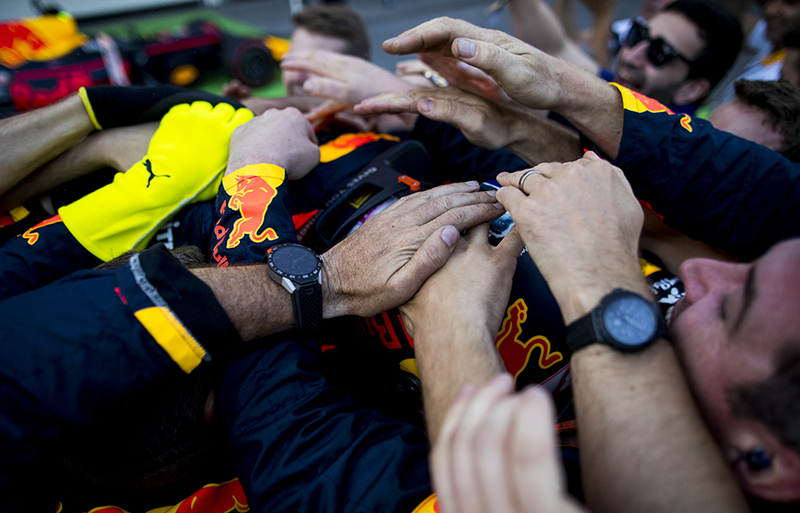 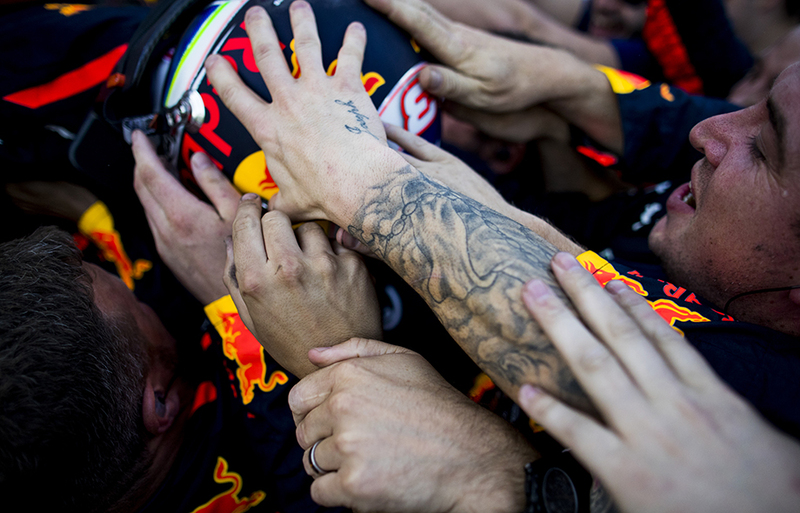 Daniel Ricciardo of Australia and Red Bull Racing is celebrated by his team following his win at the Azerbaijan Formula One Grand Prix at Baku City Circuit on June 25, 2017 in Baku, Azerbaijan. Daniel Ricciardo of Australia and Red Bull Racing takes a selfie with his mechanics following his win during the Azerbaijan Formula One Grand Prix at Baku City Circuit on June 25, 2017 in Baku, Azerbaijan. 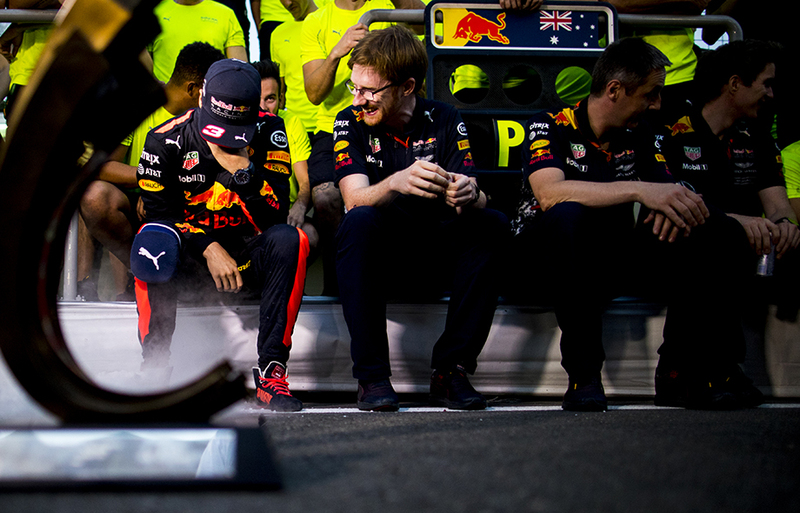 The winning trophy is pictured on the garage floor following the win of Daniel Ricciardo of Australia and Red Bull Racing at the Azerbaijan Formula One Grand Prix at Baku City Circuit on June 25, 2017 in Baku, Azerbaijan.